The Mukti Yoga 100-Hour Pre/Post-Natal training explores the benefits of pre & post natal yoga. In this training, you will learn how to safely and creatively guide women through their pre and postnatal yoga practice, enhancing their birth experience. 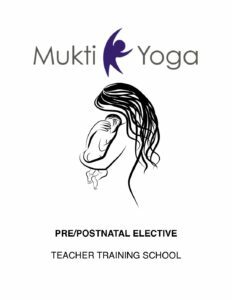 In the Mukti Yoga 50-Hour Prenatal training you will learn about the stages of labor and the importance of this information when teaching prenatal yoga. Learn breathing techniques, yoga postures, and meditations that will prepare mothers for delivery. In the Mukti Yoga 25-Hour Postnatal training you will learn how to rebuild the pelvic floor muscles, abdominal strength, relieve sore shoulders, stimulate milk production and restore overall balance in the body. The 25-Hour Mommy & Baby + Fertility yoga will teach creative, fun ways to keep both mom and baby interested and involved in their practice. Please note that Paypal charges an additional 2.9% service fee. If you are interested in another form of payment, please notate that on our Registration Form. Please note that all deposits are non-refundale. If you wish to cancel your booking, you may do so any time up to (and including) the 61st day before the scheduled start date and receive a full refund of any fees above the initial deposit, less an administrative fee of 10% or $100, whichever is greater. If you cancel between 31 and 60 days prior to the start date, you will be charged a cancelation fee of 50% of the retreat or training value, including any deposit you may have paid through Mukti Yoga payment plans. If you cancel your booking less than 31 days prior to the scheduled trip or training start date (or if you fail to show up, or if you leave a trip or training prior to its completion for any reason), then you will not be entitled to any refund. Bookings for all trips are non-transferable. Exceptions to our policy cannot be made for any reason, including weather, hospitalization, business emergencies, personal/family emergencies or personal/family illnesses. There are no discounts for arriving late or leaving the retreat or training early. If Mukti Yoga must cancel any retreat or training for any reason before the scheduled start date, you will receive a complete refund of all monies paid to Mukti Yoga, which shall constitute full settlement of any claims. Mukti Yoga shall not be responsible for any expenses you incurred in preparation for any canceled trips, such as airline tickets, or for costs incurred due to travel delays, flight cancellations or illness, etc.